This guest blog is a first for Myth, the Universe, and Everything, as the following is an excerpt from an original short story by friend of the blog Andrew Schneider being hosted at my home page, Virgil and Beatrice -- the first piece of fiction written by someone other than me to be hosted there. Andrew and I have worked together on a number of projects, from the old Empty Room Studios days to Living Kingdoms of Kalamar and Living Forgotten Realms. He's a heck of a writer, and, tomorrow, he's launching his career as a self-published novelist with not one but two titles: Undercaffienated and Overexposed: The Tale of a Coffee Shop Princess and Nothing Left to Wish For, with a cover designed by the exceptional Sarah Schanze. (That's the cover featured here.) 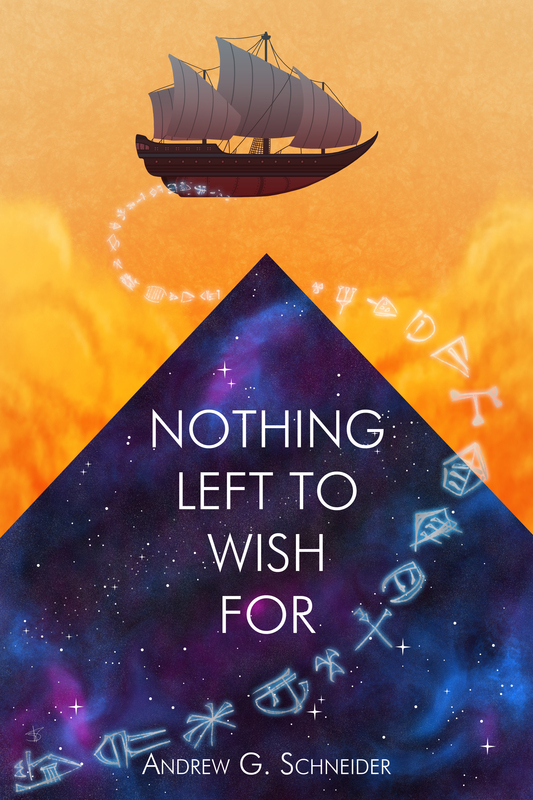 The following short story excerpt takes place before Nothing Left to Wish For; I hope you'll click through to the full story and check out the full novel! You can learn more about Andrew's books in an interview with John "Ross" Rossomangno, another fellow D&D writer. And now, without further ado, Andrew Schneider! "Cool, With Plenty of Water"
It was a simple task. Haul and cleat, steady the sail. "Six points to spinward, Mr. Harris." Steady my old bones on the rail and watch the arm of the galaxy stretch away into the sky. "We're to swing wide round that dune." "Aye, aye, Mr. Briggs." Not captain, never captain, even if it's just the two of us. I close my one good eye and listen to the sand playing over the hull, the cold wind cutting through my clothes. We're a small craft, nimble and smooth. Just me and the pilot, Jase Harris, though there's space enough for three. "Ware starboard!" Mr. Harris sings out. The bulk of the sky goes black behind the prow of a fat freighter, speeding through the deep valleys between the dunes. She's running dark and fast in the middle of the night, low and heavy on a dozen blistering thrusters. Contraband. Smugglers for sure. "We have right of way, sir?" A mammoth wedge of wood, steel, and sail bearing down without care or cause. She'll run us down and burn the evidence. "Right o' way, Mr. Harris. That's the spirit." The kid's got talent. Got what it takes to be the best pilot in the Endless Desert. "Let's show these smugglers some proper piratical courtesy." "Sir." Mr. Harris grins, his fingers dance across the wheel. Our little ship groans, her thrusters spin high and hot and we're rising, up and up. I throw my weight hard against the rail for counterbalance as we cant sideways, skate the side of the freighter and score a gash in her flank she won't soon forget. Skip off her tail and let a smattering of shots and shouts follow us into the sky. Then the freighter's gone and we're left high and lonely. Naught but the wind for company. "You ever been to the Crescent Cities, Mr. Harris?" "No, sir. Can't say I've had the pleasure." "Then hand off the wheel and step lively, port side down." I call it one of the wonders of the world. A jewel, nestled in the broad bosom of the Endless Desert. Viridian. Tourmaline. They call it a lake. A body of water as large as I've ever seen, sickle shaped and calm enough to flip the stars on their face. Trees and farms hug the outer edge and the inner rim, holding off against the ever-present sand. Here and there, like the bones of some buried giant, towers stretch up out of the green; wizards' playgrounds. Bah, wizards and their flying carpets, always reaching for the stars. Seven cities, seven ports, and seven thousand ships in and out every day. Landing lights dot the sands, calling me home. "Drink it in, Mr. Harris. Topside's too pricey for the likes us. We'll be berthed down under." Aye, my bones ache on nights like this. Read the rest of the story at Virgil and Beatrice. "Is it by thine own will, or against it?" How did it get to be Saturday again already? My very first solo-project as a game writer was Gallia, for DogSoul, back in the 3rd edition Open Game License days, so I drew on some of the same real-history research I'd done for that project about chivalric competitions. I also used jousting in a module I wrote for former LFR Regional director Andrew Schneider (who has an adventure up in this month's Dungeon), so it was great fun to be able to put all of that together in a new format. It's also super exciting to be published in Dragon! 1) Maryah is not at all a damsel in distress. When Prince Ivan, the hero, comes upon her, it's because she's just slaughtered a whole army. Possibly by herself. 2) The tale reads like you've come in at the middle. Prince Ivan, despite being a hero (and a weepy one at that), is the least powerful, and possibly the least important person in the tale. Before he enters in, Maryah has already captured Koschei the Deathless and held him captive. Koschei has already stolen a horse from Baba Yaga. All sorts of things that we never get the full story of have transpired before we step in -- which makes me think that Maryah is probably in a host of other tales that are less well known than this one, just like Koschei and Baba Yaga are. 3) This one is the most striking to me: there's this great synergy between Maryah and Baba Yaga herself in one important detail. They both ask Ivan if he's come of his own free will, or because someone else has compelled him to be there. This doesn't sound like your usual "are you friend or foe?" greeting -- no, something else very cool is going on here. It makes me think that Maryah has a relation to Baba Yaga that doesn't get mentioned in the story, either because they are both women of Power in some fashion, or in a more archetypal connection. I don't have any thoughts beyond these musings at the moment, but I really wanted to point this story out. It's a great, weird little tale, and it's obvious why folks like Catherynne Valente have grabbed onto it for retelling. There's a lot of meat here, and I'd chew on it for a novel or two. So, here's the thing about me and conventions. I go to them. I stay so busy that I have no internet the whole time I'm at them. I come home and I'm either sick or just very sleepy. A new addition to this is that I have some hundred facebook notifications to go through before I'm caught up. The result? It takes me awhile to get back to lj. But back I am! Anonycon was a wonderful way to spend my weekend, and continues it's status as the most enjoyable convention I go to. It's small, which I think is part of the charm--since this is my third year, the majority of the faces are familiar, and that makes the whole convention feel like a gathering of friends more than a gathering of strangers. I went expecting to play/run maybe three slots. I'd volunteered to work the desk on Friday and go up early to help unload, which was a great way to start out the convention. Being there early and seeing folks come in meant the crowd grew slowly--and also meant that I got to learn a new board game, Race for the Galaxy, and play a couple hands of Teachu with folks like emilymorgan, banana_pants, banana_plants, and niliphim. It also meant that when there weren't enough players for the first Living Forgotten Realms slot, I was more useful to everyone at a table than at the desk, and I got to bring out Urtog for the first slot of the convention. Saturday, I expected to play or run maybe two slots, and I started out the day with another LFR game, happily with some of the same people I'd played with the day before, as well as folks who I don't get to game with often enough on the home front. When the second slot came around, I thought I'd be playing again, but it turned out that they were short a judge for LFR. I hadn't actually prepped any adventures, expecting instead to run the last of the Xen'drik modules, but I realized that "Gangs of Wheloon" (by Andrew Schneider) was running, which I'd had the opportunity to run as a playtest months before. Given a little time to prep (and some very patient players, who waited while I looked things over), I got to run that adventure in a completely different way than it had run during the playtest, which was delightful. Hopefully the players had as much fun as I did! Now sleepy, I had every intention of going back to my room and crashing for the night. I called up Nat Rowe (one of my Dogs in the Vineyard buddies, who'd also been my train buddy and at two of my game tables) and asked where he was going to dinner. Since he and his dinner companions (including hellpossum and lyster, who you may remember from a guest blog entry here last July) were still waiting for a table, they graciously expanded their reservation for me. And so I found myself at dinner with very excellent people with whom I'd corresponded but not previously met, and they very quickly convinced me that I needed to play in a Mutants and Masterminds game with them that evening. Since the time over dinner had quickly convinced me that I would definitely enjoy further adventures among their company, I joined their number as a femme fatale in an Indiana Jones inspired quest for the Spear of Destiny (and had exactly the fun you'd expect from hearing just that much). And how can you not smile with that in your head? Perhaps not so grand, but here I am, none the less! It has been a busy four months or so, and though I'm not at a break between projects (I have plenty left to do on the adventure for Serenity Adventures, as well as some work for Rick Hershey on the Steampunk Musha RPG he has in the works), I am at a break between have-it-in-by-now-or-it's-late deadlines. The next "official" deadline (in red pen on my calendar) I have is in late May (when I will be away in Greece and Turkey, so I will certainly have it done early). It is such a nice feeling to be able to give myself permission to *not* work for one day. Then it's back with my nose to the grindstone the next! I realize I didn't blog about DDXP and my experiences with 4th Edition, and this is in part because I am a bad blogger. It is more, however, due to my participation in the conversational reviews we're doing in an ongoing fashion on the current issue of Secret Identity Podcast. Max Saltonstall, Brian LeTendre, and I are better together as reviewers than we are apart (well, in my case, anyway), and if you don't mind listening to the audio version in 15 minute increments (that's the length of our segment, "Action Point Counter Point"), that's far better as far as gaming goes than what you'll see here on my blog. But there's more news here than just convention catch up. I should have posted this at the beginning of the month, since we're almost at the midway point: for the month of March, my story "The Valley" is being published/hosted on The Edge of Propinquity Web zine. (You may know them as t_e_o_p.) Mine is the guest story for the month: the rest of the zine is serial fiction from four dedicated authors who grow their worlds with each installment. It's a site well worth checking out--and of course, I'll be delighted to hear responses to the story. I think I mentioned awhile ago that I did a number of short pieces, alongside Andrew Schneider, for the Empty Room Studios Art Book. These pieces are now filtering about the web, from the Digital Webbing forums to EnWorld to DrunkDuck as the artists tackle each description and make it their own. It's great fun watching it happen over on the ERS forums, and I'm enjoying the fact that my part in the process is completed and the pieces are finding life in other hands. Valentine's Day is never a good day in Chicago, not since the twenties. And some crooks seem to take it upon themselves to make each V-Day a little bit worse than the last. Seems like there's a challenge to beat the previous record for violence and mayhem. In Detroit, the freaks all come out for Halloween--Devil's Night, they call it. Us? We've got Valentine's Day. Ironic. The cops are spread thin as it is--the good ones, anyway, and the bad ones are useless--so I always end up on the top of a building somewhere in the Loop, trying to dodge bullets and fists. Occasionally one gets through. Two years ago it was the Sears Tower. Last year it was on North Michigan over at the Hancock. This year, I'm on Aon Center, where my day job is. On the upside, if I mess things up, I won't have to go in tomorrow. On the down side, if I mess up too much, I won't be going in again, ever. If I had known this year that Electrode was involved, I might have called in the big leagues. New York has more heroes than you can shake a stick at, and, as you may have guessed from the above, February is a slow month in Detroit. I've been known to hop over there in October to help out, so it'd only be fair. But knowing me, I'd have been a fool and ended up in this situation anyway. Yeah, that's me. Gatlin Gun ammo stinging like bees and electrified mobsters swinging lightning rods on all sides. I can smell atmo burning all around me, smell the hair on my arms burning, and feel the rest of my flesh rising in goosebumps. Not that I'm paying close attention to those details. I'm a little more concerned about not falling the thousand feet down onto Randolph. And Electrode's maniacal laughter? Not exactly inspiration for keeping grounded, if you'll forgive the pun. Frankly, I'm beginning to wish I could fly. Yesterday I received an e-mail from my friend and coworker at Empty Room Studios, Andrew Schneider. (Andrew is also one of the new Living Forgotten Realms team for the RPGA.) Back when Amazon first publicized it's Breakthrough Author contest, I pointed it out to Andrew, because I knew he was shopping around a novel. Recently, a small group of the five thousand entrants into the contest found out that they'd be continuing to the next part of the competition, and Andrew's novel is among them! "From now until March 2, we're inviting Amazon.com customers to download, read, and review excerpts from our semifinalists and help decide who will make it to the Top Ten. Penguin will select manuscripts to read from the semifinal round based on customers' feedback and Publishers Weekly reviews." As a note, there's also a ginormous prize package (including a Kindle, $2000 in Amazon credit, and sundry other gifts) going out to folks who post reviews of the titles. So going over and writing some reviews is a win-win proposition. If you'd like to read Andrew's piece, you can find it here. There are 104 entries classified as science fiction/fantasy, another 36 in the romance category, 202 in mystery/suspense, 74 historicals, and an overwhelming 420 in general literature. Plenty of reading material for the procrastinators out there! I've also got a couple of reference assignments and a gig writing a modular adventure for a campaign that isn't Living Kingdoms of Kalamar--which is a first for me. (This assignment also gives me the great pleasure of working with Shawn Merwin again, which is always a treat.) I submitted "Nomi's Wish" one last time to a competition in the UK, and we'll see how that goes. That's one piece I really just want to exist somewhere outside of me, so each time I send it out somewhere, I hope that's the place that becomes its new home. Other than that, we've been watching a bunch of Star Wars around here; we picked up Star Wars awhile ago, then watched both Empire Strikes Back and Return of the Jedi this week. Youtube has completely ruined moments in these movies for me (courtesy of, I believe, coffeeem), and if you don't want to have giggle moments at Vader's expense, don't watch this one, and certainly not this one. Really. I'm also working on drumming up a few more interview opportunities for Cowboys and Aliens: Worlds at War on the net. If you'd like to promote us, let me know! We'll be announcing a contest on Monday, I believe, so check back both here and on the W@W site for more details! 2) Decide whether I have time to do another super-quick reference assignment, and then either say I can't take it, or get it done. 3) Edit a Living Kalamar module, as soon as I get the final draft. 4) Write a blog entry I promised shanna_s I'd write. 5) Write two press releases for Baeg Tobar/Empty Room Studios. In other news, I got my copies of Allies and Adversaries today! The artwork, as usual, is superb, and it features the nifty descriptions of the Into the Reach characters that I originally worked up for the White Silver website, as well as nine other characters I wrote up, including Johnny Twostep. He plays a bigger part in Regaining Home, and I've heightened the mysery of his background. But just as Shepherd Book never revealed his past, Johnny's not likely to, either. Other contributors include Trevis Powell, who wrote the novel No Hero for White Silver; Lydia Laurenson, author of Scroll of the Monk and other White Wolf projects; up and coming game designer Andrew Schneider, who is working on some Empty Room Studios projects; and several of the contributors to the original Chronicles of Ramlar rulebook. From what I've skimmed, the writing is quite good, and the character profiles are fairly extensive. It's a neat little book (and by "little," I mean 226 pages).